Pace calculator is a useful tool which helps you estimate the speed at which someone or something moves. If you want to find out how fast you are able to run or cycle, you don't need to crunch the numbers any longer. Use our running pace calculator to estimate your pace in any unit of measurement you wish and compare it with the average running speed. Firstly, let's make it clear what the difference between pace and speed actually is. Although both values express similar information, they do it in the opposite way. By counting pace you find how much time you need to cover a particular distance, while speed indicates number of kilometers you are able to do within one hour. As a result, we use different measurement units to express these values. Pace is given in unit of time per unit of distance, whereas speed is vice versa. The pace calculator is a tool which counts your pace and speed on the basis of the distance you've done and the time you've done it in. The calculator will automatically estimate your average speed (km/h) and pace in a variety of units. Thanks to it you don't have to convert the units in order to find out how much time you need to do a kilometer, meter, mile or yard. If you only need to measure your velocity and you are not interested in pace, you can use a more simplified calculator. Velocity calculator is a tool which needs only distance and time to estimate your speed in meters per second. If you have your speed already calculated but you need it in another unit of measurement, you can use our speed conversion calculator. This tool enables you to convert between 5 different measurement units of speed. Average running speed indicates how far a person is able to run in a particular period of time. The value depends on a range of aspects such as: age, weight, height, wind and even culture. However, the average human running speed is estimated to be 15 miles per hour. 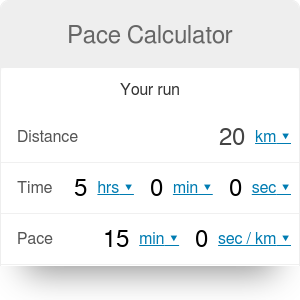 You can use the running pace calculator to compare your results and estimate how fit you are. If you know that you need a harder workout but you are still not sure how much you should exercise, test our target heart rate calculator. This tool will help you set fitness goals so that you could get the best results and not overexert yourself. Pace Calculator can be embedded on your website to enrich the content you wrote and make it easier for your visitors to understand your message.